EMPLOYMENT OPPORTUNITIES: (instructions) NO PHONE CALLS PLEASE!! 3 years minimum experience in sales and/or purchasing in the electronics industry with a strong customer following. If you meet the above requirement(s) and are interested in working for Rose Electronics, send an email with an attached copy of your resume for consideration to Personnel. Someone from Rose Electronics will contact you if you meet the requirements of any of our open position(s). 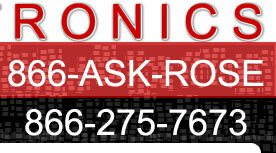 Thank you for your interest in Rose Electronics, Inc.